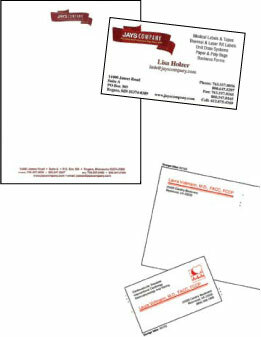 for business cards, stationery and second sheets, envelopes with the option of windows, courtesy note cards, bulletin paper and more! Super Choices – Virtually any color ink combined with a variety of paper stocks including hi-gloss, fiber-tone, laid, linen, premium and recycled. Fast Delivery – Most orders will be filled within five working days. Give Us A Sample – Send us a sample of your current stationery or a detailed sketch of your concept along with an electronic file of your logo. Once we establish your requirements, we can give you a price quote. Choose your design from several free layouts or create your own.